Do you like to spend a lot of time in your backyard or otherwise outdoors? Do you find yourself often plagued by unforeseen bad weather and wishing you had something to help protect you and your family? Are you interested in setting up a canopy in your backyard? If so, this article is here to help! Below, you’ll find reviews of five great products to help you determine the best canopy for wind and rain to suit all your needs. You’ll be able to figure out which canopies have the qualities you’re looking for most and which ones will fit into your backyard, too. No matter what type of event you’re looking to host, these canopies will be able to help you regardless of the weather situation. Material - With the wrong type of material on your canopy, you may notice mold, mildew, or more frequent wind and rain damage. Stick to water-repellent and heavy-duty options for best results. Stitching - Be sure your canopy has reinforced stitching to ensure it won’t tear or fly away during wind events. Vents - Many canopies have optional vents to help protect them against wind drafts. These vents may be detrimental during rain, however, so think carefully about the position and type of vents in your canopy. By keeping these qualities in mind, you’ll be sure to choose the right canopy right away. So let’s get started! When you need a great low-cost canopy to get the job done right, check out the Le Papillon Instant Foldable Outdoor Pop Up Canopy. 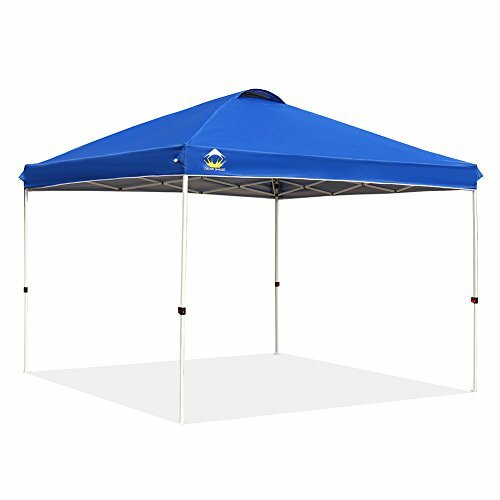 This blue canopy tent is sturdy with a powder-coated steel frame and is as lightweight as it is durable. It’s designed to set up quickly and stay in place without worry no matter how strong the winds might be. The included carrying case makes it easy to bring this tent along with you for all sorts of adventures on the go. The Velcro attachments for the canopy roof are easy to manage and stay in place well, too. 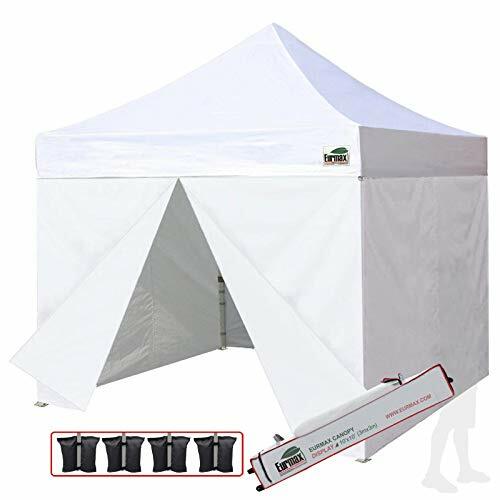 If you want to use this tent with any sidewalls, you will need to purchase them separately, as they do not come with this setup. You will need the help of another capable adult or older teen to get this tent set up, as it’s a two-person job. Set up this Crown Shades Outdoor Popup Portable Shade to get started enjoying your backyard in style right away! This straight-leg canopy is easy to set up with its central hub design, and it can be adjusted to three different heights as needed at the push of a button. The frame is made of steel, and the canopy itself provides UPF 50+ protection against the harsh rays of the sun. Best of all, it comes with everything needed to stake it to the ground and store it when the time comes, too. The carrying case with this product is wheeled for easy transport. One person alone can set up this canopy with no trouble. There aren’t any color options with this product, so it may be tougher to match to specific events. 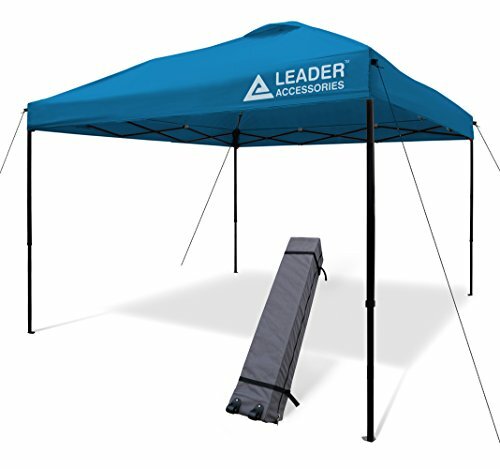 For a quick and easy canopy tent that will work for any event or day trip, go with the Leader Accessories Instant Pop Up Canopy. 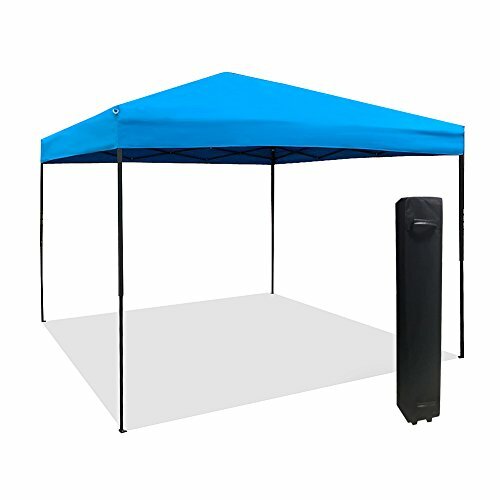 This is a great 10’x10’ canopy with a single-piece frame that is easy to assemble and take down. The top of the canopy is vented to make it even more breathable and resistant to wind damage, too. This product has several different color choices. The vented roof works very well. If you want any sidewalls, you will need to purchase them separately. Some products may arrive with holes in the fabric. The ABCCanopy King Kong Series Commercial Instant Canopy is an incredible option for anyone looking for a sturdy and solid canopy for any needs. The frame is made of steel and the canopy is made of durable polyester, and these materials work together to create an excellent canopy that will last a long time to come. This product comes in thirty different colors. This is one of the best-selling canopies on the market today. This product cannot be assembled by one person alone. The tent doesn’t come with any weights or stakes. With the Eurmax Ez Pop-Up Canopy Tent, you can enjoy your time outdoors without worry. 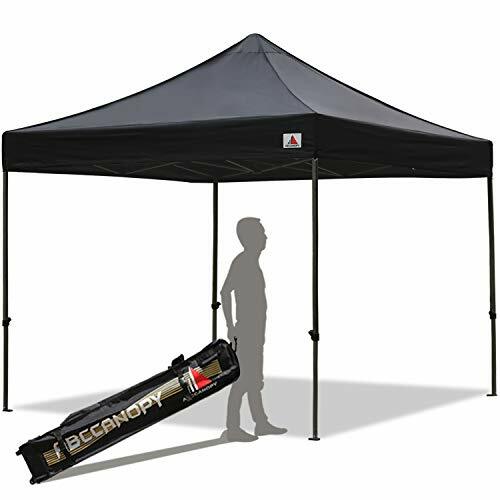 This heavy-duty tent is 10’x10’ and features four separate sidewalls that come with the canopy itself. These sidewalls can be removed individually or all at once depending on the type of setup you’re looking for with your tent. The fabric is sealed with waterproof seams and the fixtures are all Velcro. This product is available in lots of different colors so you can easily match whatever you’re looking to match. The tent is very easy to set up and the walls are easy to put up and take down. Rarely, the window portion of the tent may be damaged on arrival. Some products may be missing the weights or stakes. You have a lot of choices when you’re trying to pick the right canopy for your needs. While most of these canopies are similar in their design and functionality, there are still a lot of subtle but important differences to keep in mind when making your decision. Take your time and think about your yard, the type of event you’re planning to use the canopy for, and how many people will need to fit under it. You should also keep your budget in mind when shopping for your new canopy, too. Of course, if you don’t have a good quality canopy to protect you and your family from wind and rain, no matter what type of event you may be hosting, you could end up having to usher everyone inside to continue the festivities. You might also end up stranded on a beach or camping trip with no way to get dry if a sudden storm should crop up! There are tons of great reasons to have one of these canopies on hand, so bring home your favorite one today.